Hay bales are iconic of farming, but one of the limitations of keeping animals on a city lot is figuring out how to store them. Whole hay bales are easy to stack in the corner of a garage, shed, or coop, but once you open it up a hay bale or straw bale, it will be everywhere unless you have a plan. We fortunately have an attached garage that has worked fabulously as a wood shed, rabbit barn, and hay bale storage area. The kids and the cats seem to think that loose straw is a great toy, but the goats and rabbits really don’t appreciate previously used hay, and I prefer not to track it all into the house. 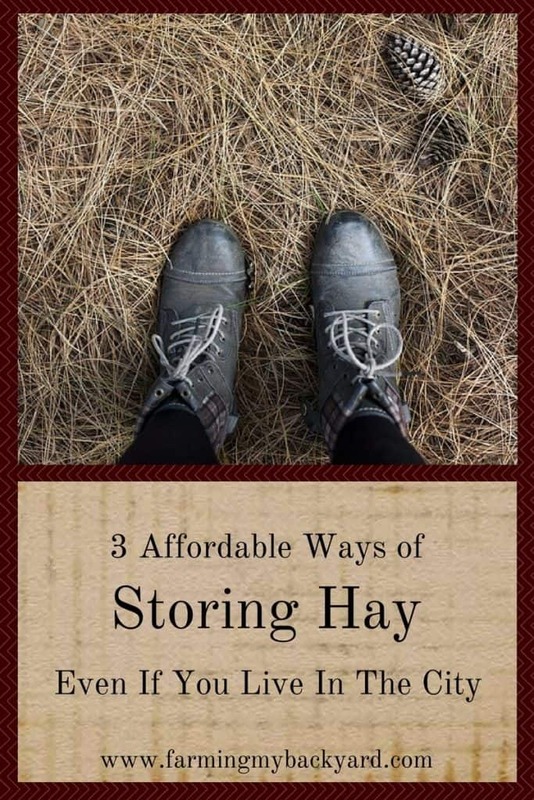 So what’s the best way of storing hay without a barn? My first hay storage idea was a re-purposed leaky wading pool to keep all the loose hay from spreading everywhere. With a tarp on top it stayed clean, and I can carry out serving sizes in a five gallon bucket. This works well until the kids decide to jump into the hay, and the cats still manage to find their way under the tarp. A neighbor mentioned they purchased small bales of alfalfa for their rabbits, put it in garbage bags and stored it in the crawl space above the garage. That got me to thinking about a new use for some large garbage bags we had leftover from some home improvement projects. I don’t buy alfalfa because I don’t have a non-GMO source, so I use larger bales of orchard grass. Heavy duty black contractor bags are just the right size for a bale of hay. The straw bales are slightly larger than the hay bales and one bag doesn’t quite fit a whole bale. I tend to split the straw up between some bags, but I recently upcycled an old garbage can as a more permanent solution. I like this a lot better than the garbage bags because the can has a lid and it also is on wheels. What’s the best way to store hay? Anything that keeps your hay off the ground and out of the rain is going to be an excellent choice. Using a plastic can was the easiest and cleanest method for storing hay I have found. If you have the space for a large manger, make it big enough to store a full bale. We made one big enough for the goats, and that was great. I still preferred the can for the rabbits though! How do you store hay and straw for your animals? Do you have an official hay barn or does it have to share space? Do you have little critters that like to play in it too? Share in the comments! Thanks! Until I tried that we had hay EVERYWHERE. Since then I’ve started putting it in old feed bags and then stacking the feed bags in the pool and that works even better. Those are clever solutions to a small problem. The wading pool is such a great idea! Thank you for this post. We are planing on getting chickens in town, so this info will be useful. Glad to hear! 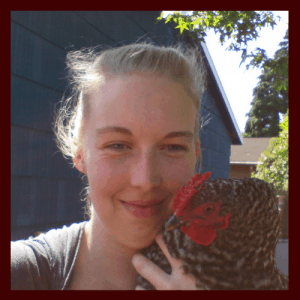 Chickens are awesome. I put a hay bale in the largest rubbermaidy type storage tub I could find, then cut and remove the twine. The locking lid keeps it clean and dry outside. If the bale is really large I stuff a few flakes in an empty feed bag and keep it in the garage. I also turned a feed bag into a tote for bringing hay to each rabbit hutch without spills. I use hay and straw and keep it in a large wheelie bin ( I can’t reach the bottom without a rake). Using a rake to get to the bottom is a great idea! Have small 4 by 8 she’d, installed shelving, used huge Rubbermaid containers that were on sale at Walmart , folks use to put Christmas decorations in….turn hay bales on end, so I can put 2 per container….my biggest issue is all the hay that the goats waste….made and bought 2 different mangers, but they still waste it….help..
That’s a great way to store it! Mine were terrible at wasting too.